There’s nothing quite like watching kids faces light up when they’ve seen a magic show. And for many kids, they may even be inspired to try doing some tricks of their own. Like any good magician, they’ll need tools of the trade and a good magic set will give them the tools they need to learn the art of illusions and even perform a magic show of their own. Magic sets aren’t only abracadabra’s and presto-chango’s but a great way to spark their creativity and imagination. 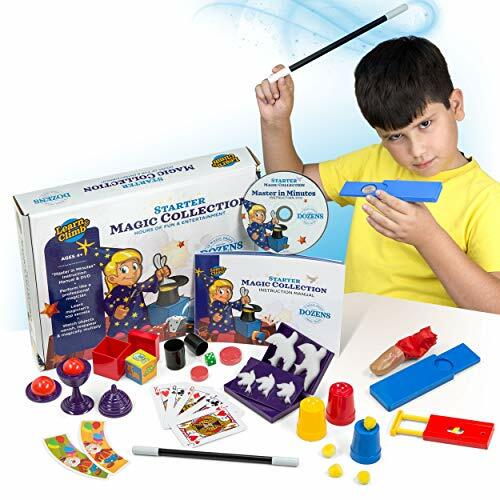 If your child has their heart set on learning a few illusions and magic tricks, these sets are sure to have your kids showing off to their friends and family in no time! Before we dive into the list of the best magic sets for kids, let’s take a look at how learning magic can actually benefit kids. You might just be surprised. Magic is fun, but could it be a learning experience too? Absolutely. Here are some benefits of learning magic! Entertainment. It’s hard to deny that we all love a good magic trick. Magic is a great way to entertain friends and family as well as themselves. Learning magic can keep kids entertained for hours! Creates bonds and helps with social skills. A good magic trick is not only a good way to break the ice when making new friends but can also be a good way to cheer up a friend and family member who could use a good smile. Boosts confidence. Whether it’s a small group or a large one, having kids perform in front of people can help grow their confidence. And just watch them beam when they master a magic trick! Helps kids get better at their fine motor skills. Whether it’s a sleight of hand with a card or a coin, or younger kids who are still getting a grasp on fine motor skills, learning magic tricks can help them practice. Spark kids imagination. There is no doubt that the world of magic can fuel kids imagination! Giving them a magic set is a way to let them explore the world of magic and fully immerse themselves in becoming a little magician. So when looking for a magic set, what are some of the magic tricks all beginners should learn how to do? Here are a few classic magic tricks kids will love learning! No big magic set required. Card tricks require nothing more than a deck of cards and the magician. However, many of the sets on this list include the deck of cards along with the “secrets” on how to perform card tricks. Whether it’s a coin or a ball, disappearing tricks are sure to make everyone’s eyes widen and maybe even get an audible gasp. While kids might not be making you float anytime soon, learning to make something small like a dollar bill, playing card or pencil float is tons of fun! How do they stick a pencil through a piece of glass that has no hole in it? It’s a fun trick that will stump you and their friends. Pick a number, any number. Or a card. Whether it’s dice or a deck of cards, kids can learn to read your mind and figure and out what card you have or what number you are thinking of. It’s time to make some magic! We’ve chosen kits that are suitable for older kids as well as little magicians as well. No matter which kit you choose for your child, they will be able to learn magic and perform a show in no time. This famous duo are the masters of magic, so it’s no surprise that their magic set will have kids doing tricks that will leave you and their friends stumped. This set will teach them how to perform over 200 tricks that are not only easy to learn but will keep your child entertained for hours learning them. This set is best suited for a little older kids, at least 8 years old. Not only does this kit include a book but a DVD that shows kids how to perform many of the magic tricks. It’s worth noting that of the 200 tricks, many are card tricks, and surprisingly this kit doesn’t include a deck of cards. However, the other tricks will utilize the props included. 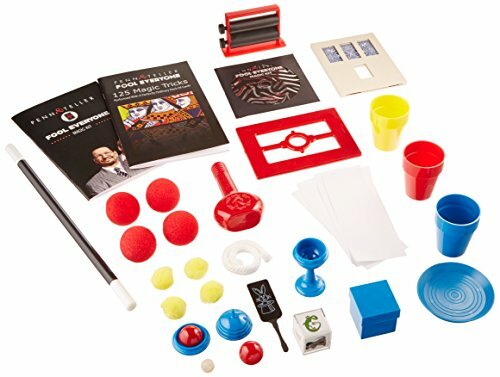 Some of the tricks and illusions kids will learn to do include Penn & Teller’s signature Cups & Balls trick, Zig Zag Card, Penn-A-Tration Frame, and others. DVD and booklet teach kids how to do over 200 tricks. Teaches famous Penn & Teller tricks. Doesn’t come with a deck of cards. For the preschoolers who want to start learning magic, this set is for them. For ages 4 and up, the Magic in a Snap! Abracadabra Collection includes everything to get young ones doing some pretty amazing magic tricks at a young age. This 10 piece set has everything your little magician will need to perform tricks like Color Changing Silks, Long & Short Card Illusion, Zig-Zag Numbers, King to Queen, and Rope Cutter. And what is a magician without a magic wand? This set includes a wand as well. The instructions are easy-to-read and the tricks are easy to follow for even young kids. And to top it off, this is the most affordable magic set on the list. Great quality tools for impressive tricks. Kids limited to the 6 tricks. For anyone, young and old, who is interesting in getting started learning magic, this is the set. The tricks are easy to learn too since kids will be able to go to magician Jim Stott’s website and watch videos that explain many of the magic tricks plus even some extra tricks too. This set includes plenty of items to have kids doing more than 350 tricks! Some of the items included in this set are the incredible levitation system, svengali card deck, top-secret vanishing device and more. Due to the complexity of some of the tricks, this set is recommended for kids 10 and up. Online videos make it easy for kids to learn tricks. Kids will learn more than 350 tricks. Magic tricks will impress kids and adults. Some of the props aren’t very durable. The secret is out! 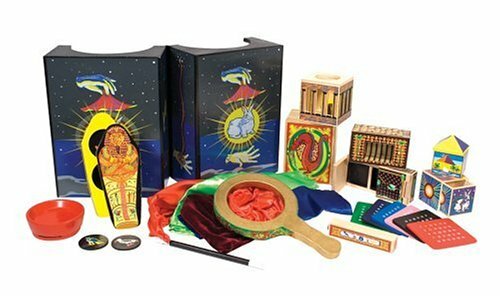 Melissa & Doug Deluxe Magic set will get children excited to learn some classic illusions like the Disappearing Ball, the Vanishing Coin, and the Secret Silks. Because fine motor skills are needed for the magic tricks in this set, it is recommended for kids 8 and up. Everything kids need to perform 10 magic tricks comes in a durable wooden box that works great for storage when kids are done practicing. Though this set includes step-by-step instructions to explain the 10 magic tricks, some kids found the instructions a little tricky (no pun intended). As to be expected from Melissa & Doug, this well-made set will last your child for years. Comes with everything to perform 10 magic tricks. Sturdy storage container holds everything. Perfect for kids 8 and older. Quality made tools will hold up to plenty of use. Instructions for some the tricks were a little difficult for kids to read. May need parents help. Does your child want to show off some serious magic card skills? 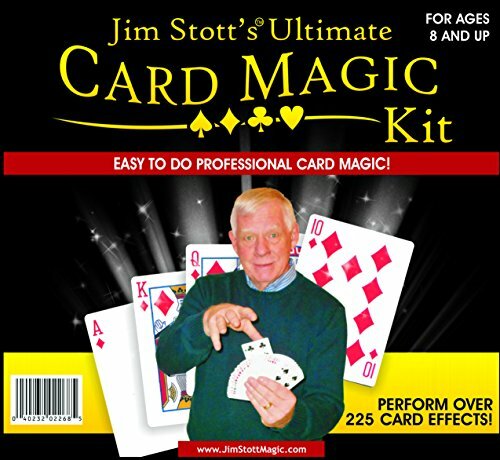 Here’s another set by magician Jim Stott, that will have your child wow-ing his friends with card tricks in no time. This Ultimate Card Magic Kit comes with 3 different decks of cards: the svengali card deck, wizard stripper deck, and phantom marked deck. This set also comes with a magic card box and vanishing card case. 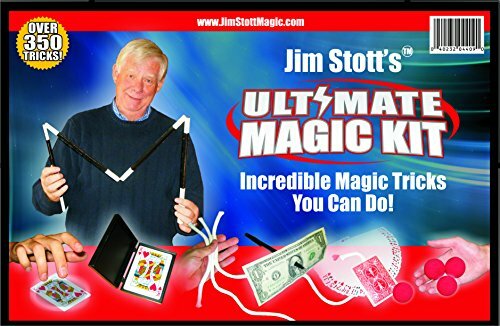 Like the Ultimate Magic Kit mentioned before, this kit will provide magicians a link to his website with tons of videos that teach kids card tricks. This kit is best suited for a little older kids, around 8 years old and up. Comes with 3 different card decks. Online videos make learning card tricks easy. Professional card tricks will impress kids and adults! This budget-friendly beginner magic set is perfect for young aspiring magicians and even includes an easy-to-read instruction booklet and a DVD where kids learn the tricks from a professional magician. Budget-friendly doesn’t mean cheap either. 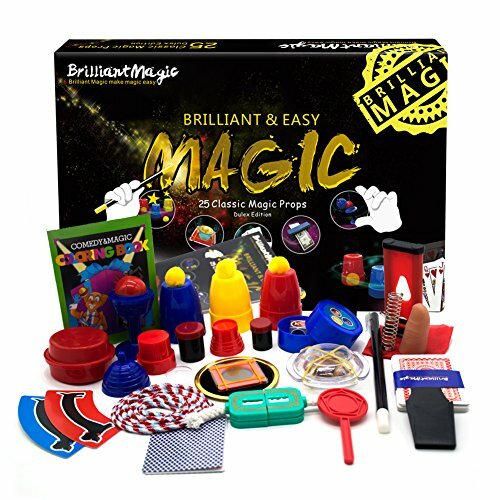 This set includes everything kids will need including a magic wand, cards, mind-reading magic box, coin box, a finger chopper, cups and balls and more. Suitable for kids as young as 4 years old. Instruction manual and DVD made learning the tricks easy. Fun tricks like the Finger Chopper and the Vanishing Coin. DVD may not play in DVD players. Watch kids disappear as they run off with this fun magical set! When they come back to show you all the tricks they learned, the Magic Spectacular Suitcase acts as a performance table. Not only will kids get a ton of magical props including a wand, a magic hat, a magic drawer box, mystery card deck, cups, balls, hanky vanisher, multiplying rabbits and more. Kids will have everything they need to do more than 100 tricks like multiplying balls, card tricks, jail escape, and traveling handkerchief. Comes with both a wand and magic hat. Suitcase also acts a performance table. Everything needed to perform 100+ tricks. Online videos and instruction manual make it easy to learn tricks. Suitcase/table is made of cardboard. You and your child will be amazed at everything that comes in this set. Just to name a few, it includes a money printer, numerology cards, mood reader, miracle ropes, amazing stretch dogs and more. 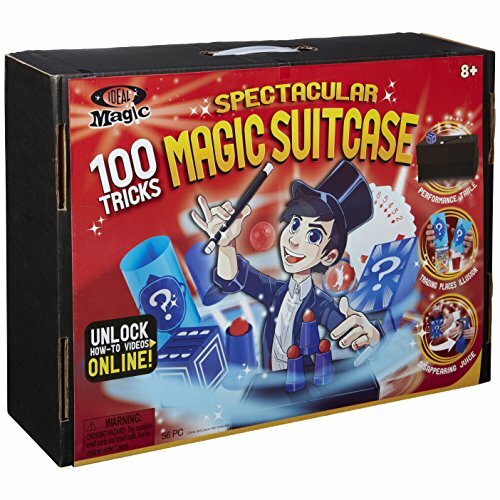 With this set, kids can perform 25 impressive magic tricks. The instructions are very easy-to-follow and all the props included are durable, making this set suitable for kids as young 6. Comes with plenty of props. Great for beginners and young magicians. Instructions are easy for kids to follow. Limited to the 25 tricks. Here’s another set by a famous illusionist, Criss Angel, who will have your child learning more than 400 magic tricks. 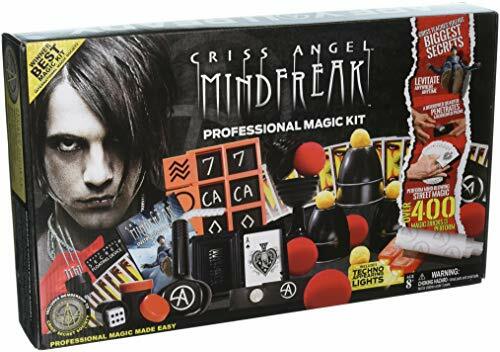 This kit also comes with an online membership to Criss Angel’s Secret Society that will have kids learning 200 more tricks taught by Criss Angel himself. This set comes with a ton of magical props including a Mind Reading Blackboard with a marker, Mental Freak Cards, Mind Freak Secret Deck, Cups and Balls, a Secret Floating Device, Prediction Tubes, Coin Case Transformation and much more. The MINDFREAK magic kit comes an instruction book and is suggested for kids 10 years and up. Comes with plenty of props to perform 400+ tricks. Access to Criss Angel’s Secret Society for 200 additional tricks. Tricks are easy to learn. Some of the props may break with frequent use. 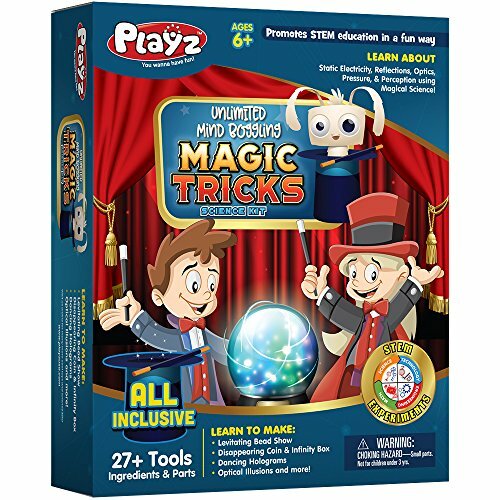 The Playz Unlimited Mind Boggling Magic Tricks Science Kit takes the best of science and magic, puts it together, to have kids not only entertaining you and their friends with some fun magic but also learning some STEM skills in the process. This set comes with everything kids will need to perform tricks like Mind Reading Squid, Disappearing Coins, Hologram Theater and more. Easy-to-follow instructions are included and this set is suitable for ages 6 years and older. Comes with over 27 tools and ingredients. A great STEM activity too! Great for kids as young as 6 years old. Won’t be able to do classic magic tricks with this kit. Q: What age can my child start learning magic? A: We’ve included magic sets for kids of all ages, the youngest being 4 years old. That said, most magic tricks require some fine motor skills in order to perform them. Be sure to choose an age-appropriate magic set for the max amount of fun! Q: Do I need to help my child learn magic tricks? A: Not necessarily. For really young magicians, you may need to help read the instruction manual or set up the instructional DVD if provided. But luckily, most magic kits provide easy-to-read instructions that kids can follow on their own, which of course, is part of the fun! And of course, the whole point of a magic trick is after all that a magician never reveals how the trick is done. We’ve reached the end and now it’s time for you to disappear…. And select the best magic set for kids. 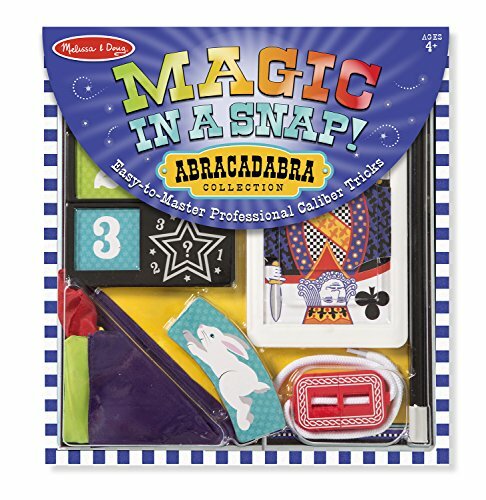 For the really young magicians just starting out, we suggest the Melissa & Doug Magic in a Snap! Abracadabra Collection. It’s perfect for kids as young as 4 years old and for the price, you’ll be surprised by the magic tricks they’ll be showing you.